Planting a bougainvillea is not that hard, but you will need to take some of the plant’s growing habits into consideration first. Bougainvilleas grow best outdoors in warm locations such as zone 9 or higher. Once planted and established, a bougainvillea can be an eye-catching wonder. There is nothing quite like a bougainvillea in full bloom. The plant comes in a variety of colorful blooms and sizes, but all have the same basic needs. Planting a bougainvillea in your landscape will give you years of spectacular viewing pleasure. Consider the maximum size your particular species of bougainvillea is expected to grow to when selecting a planting site. Give it enough space to grow and not interfere with surrounding plants. Choose a site where the plants thorny limbs won’t interfere with the everyday activities of people. Don’t choose a location to plant it, such as by a doorway or the edge of a porch, where the limbs can stick someone. Select an area that receives at least 5 hours of sunlight each day to receive the maximum amount of blooms. Do not plant your bougainvillea in a shady area or you won’t have any blooms. Dig a hole three times bigger than the plant’s container. Mix cow manure and peat together with the existing soil before planting the bougainvillea in it. Remove the bougainvillea from its container, being careful not to hurt the root system. The roots on young, container grown plants are quite sensitive until established in the soil. Place the plant into the hole, and pack the soil around it. Water the freshly planted bougainvillea well. Continue watering twice per week for the first few weeks. Bougainvilleas are quite drought tolerant once they are established but will not tolerate soggy feet. Water once a week to every two weeks once they are established. Fertilize the plant with a fertilizer high in Iron every three months during the blooming season. 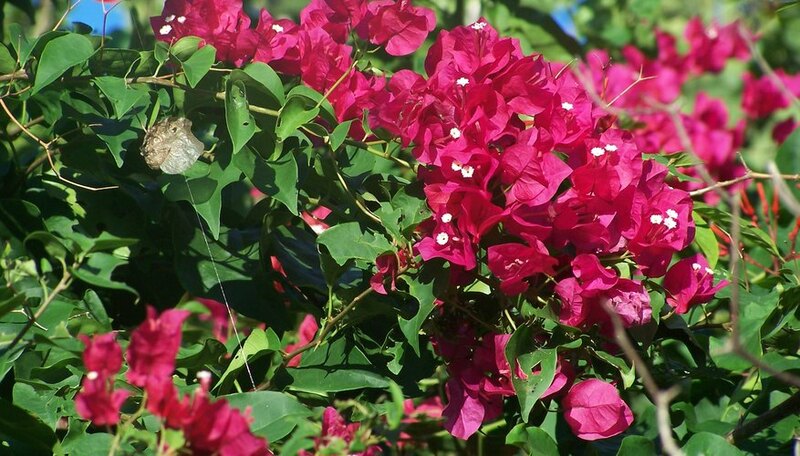 Give the bougainvillea a hard trim at least once a year in the late spring or summer. This will promote more blooms and fuller growth of the plant. Bougainvilleas are hardy once established and have very few if any pest problems. Use caution not to be poked or step on any pruned branches. The thorns can be irritating to certain people's skin.